Le Parc des Sérigons är en camping i La Roche-des-Arnauds, Hautes-Alpes, belägen i skogen och vid en flod/ en bäck. Campingen har platser med skugga och platser med lite skugga. Det finns möjlighet att hyra husbilar, vandrarstugor och bungalows. På campingen finns en lekplats och ett sportområde. Denna inspektör gör varje år ett besök på Le Parc des Sérigons och inspekterar campingen för ca 200 faciliteter och för andra förekommande punkter. Inspektören är en medarbetare från ACSI och arbetar inte för campingen. We stayed for a week at Parc des Serigons and we would recommend it wholeheartedly. The location is beautiful. Pitches are very generously proportioned. The management and staff are warm, welcoming, helpful and informal. When we arrived, we were indecisive about whether we wanted electricity, how close we wanted to be to the toilets etc, and the manager could not have bee more patient and accommodating, cycling around and showing us different options until he was sure we were happy. In the end, we pitched in a spot that was nothing short of idyllic, framed by evergreens, at the side of a field of purple flowers with mountains beyond. Toilets, showers and pool were all absolutely fine. Good restaurant and cafe on site, and reasonably priced fresh bread on order for the mornings. The staff were also helpful in offering us nearby walking routes, handing us out sheets to guide our way. And the walking is pretty spectacular nearby, with fabulous Alpine views easily accessible for our two boys. Our ten-year old also enjoyed some of the organised activities including football and volleyball. Our five-year old enjoyed a morning of crafts. And I enjoyed access to ping pong pretty, rarely needing to wait for long (if at all) for a table. Vill du boka Le Parc des Sérigons eller få mera information? Det går bra med nedanstående uppgifter. 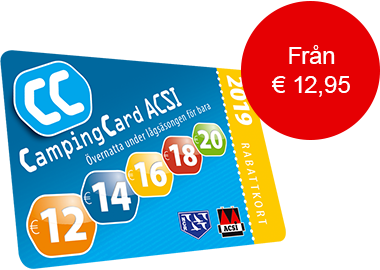 ACSI Eurocampings skickar din informationsförfrågan till "Le Parc des Sérigons".